If you want to control the brightness of a LED, the speed of a DC motor or the direction of a servo, you will need PWM. The video shows PWM being used to control the brightness of some LEDs. Pulse-width modulation (PWM) is used to control the amount of power supplied to electrical devices, especially to DC motors, servos and LEDs. 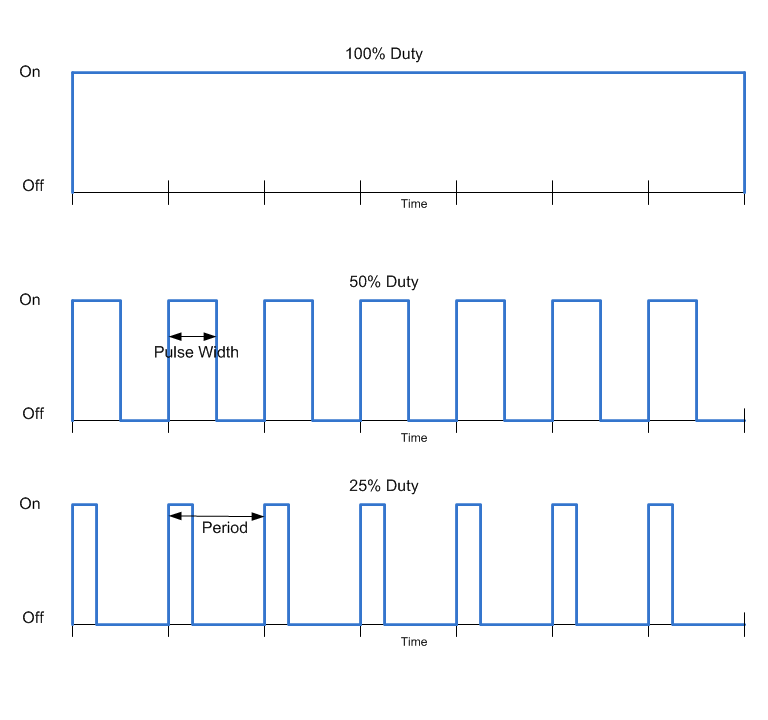 PWM is able to achieve this by quickly turning off and on the power to the device. The measurement for this is duty cycle. Duty cycles describes the proportion of 'on'; a low duty cycle corresponds to low power, because the power is off for most of the time. A high duty cycle corresponds to high power, because the power is on most of the time. Duty cycle is expressed in percent, 50% is when the power is on half the time and 100% being fully on. PWM can be performed in a number of ways on the Raspberry Pi. The Pi can perform PWM in hardware, but this can only be done on one pin (GPIO18) and when enabled it interferes with the audio jack. It is also hard to get working. Last time I looked, you had to recompile the kernel. PWM can be performed in software. This is a very easy option. It isn’t as precise as hardware PWM however in most instances software PWM will do. In this post I will demonstrate how to use a modified version of Pi-Blaster, a software based PWM to control the brightness of some LEDs. I modified it to allow the pins for PWM to be specified at startup. 1. Download and compile pi-blaster. We are going to use pi-blaster in the user space. Once started, it runs as a background process. If you start pi-blaster without any parameters, it will enable PWM on the default pins. 3. Configure PWM on a pin. Pi-blaster creates a special file (FIFO) in /dev/pi-blaster. Any application on your Raspberry Pi can write to it (this means that only pi-blaster needs to be root, your application can run as a normal user). You can write your own programs to control PWM just by writing to /dev/pi-blaster. 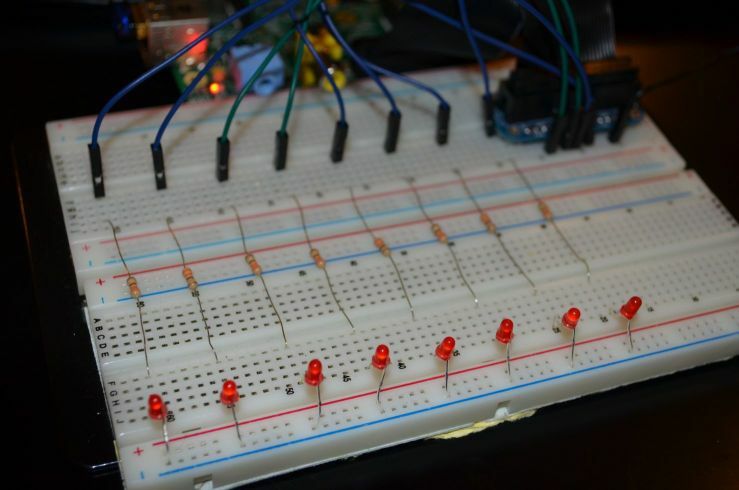 // arrays used to control brightness of a row of LEDs. left then right animation. // using PWM with a 2 second puase between levels. // This section will cycle through the power levels 5 times. Thanks for this post, the code at the bottom of the page. What language is it and how would I make my Pi parse it? I think I have found out what my issue was. After guessing it was C, I found out that the "#include" were empty. I filled this in then performed the following. can you tell me which includes are missing? What is the frequency of the PWM output and can it be adjusted? If you do not neet a resolution of 1000 steps (approximately equivalent to a 10 bit DAC), then you can reduce the number of samples or increase the duration of the steps. Is is possible that I can't make/install pi-blaster? Or do I miss some logical stepps you hadn't mentioned? What issue are you having? Can you show me the error message? After retrying and deleting everything again the "nothing to make" error dissepeared. So it's working! Hi I've been playing with motor control in Python with my pi. I was formerly using GPIO direct pin addressing, but wanted to try pi-blaster to reduce CPU usage. I have pi-blaster installed, and I can see that it's running, as it reports its details, as per mwilliams03's post above. Also, when I execute my Python code, I can "cat /dev/pi-blaster" and see the appropriate values written to the file that I expect from my code. The values don't seem to generate output on the designated pins though. That is, the output voltages for my motor control pins, according to my multimeter, appear to be zero, where I would expect them to be corresponding voltage values. So, pi-blaster seems to be writing to it's file correctly, but no corresponding outputs. Anyone have any thoughts? Do oyu have some test result, on how exact the timings are? Are there any timing varities if you've got more clients on it? e.g 20 servos? I don't have any test result. I would expect though, that some voltage would be visible upon writing to "/dev/pi-blaster" though, no? Ran across your fork while investigating linear actuator control options for a solar array using my new Raspberry Pi. If you have any ideas on what I can do or should do differently, please let me know. before I start digging in to source code, anyone know why am i getting is error? OK, I figure it out. echo "7=0.01" > /dev/pi-blaster write out channel number instead pin number it seems works. But default controls eight gpio pins and I just need one pwm gpio25 and other gpio s needed for other purpose, so little more fiddling, “pi-blaster 25” returns ‘Number of channels 1’ so writing file echo "0=0.01" > /dev/pi-blaster channel index 0 as single gpio or the first gpio number, so I can use other gpio’s for other purpose and have one pwm channel.